In this article, we’ll take a look at an experimental Soviet cartridge (5.6x60mm) and an interesting technological failure of the manufacturing process. This article is based on one written by Nikolay Dvoryaninov, a renown Russian ammunition and firearms expert. Dvoryaninov’s article was published in Kalashnikov Gun Magazine. 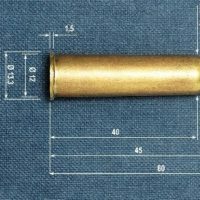 The 5.6x60mm cartridge was a mystery even for the owner of the case and author of the mentioned article – Nikolay Dvoryaninov. He found it in the collection of his father (Vladislav Dvoryaninov) who is an iconic Russian ammunition designer and for many years was the head of the ammunition department of TsNii TochMash. Vladislav Dvoryaninov is responsible for the development of many Soviet/Russian small arms cartridges and experiments in the field of small arms ammunition.